A manufacturer of food ingredients required process control for food ingredient production at their facility. 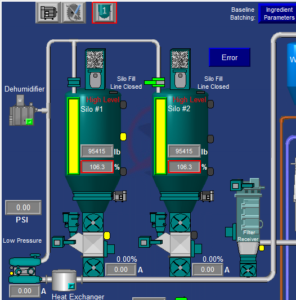 Several process control systems were required. The final automation and process control for food ingredient production included three (3) process control systems consisting of granulated sugar control and multiple batching systems. Let’s break the three systems down into System A, System B and System C. In order to automate the customer processes, primarily new equipment purchased separately, we worked with the customer to meet his specified voltages, e.g. 480V 3∅ 60Hz motor voltage and 24VDC control voltage. System A: was designed to unload trucks to either one of two storage silos using a 4″ fill line. The silos and the conveying system utilize a dehumidifier and cooling package to purge the cool dry air to the top of the silo and to connect to the inlet of the pressure blower for transfer air. The silos include a top mounted dust collector on each, along with high, mid and low level senso rs/indicators on each silo. Bin dischargers are used to promote the flow of granulated sugar to feed the material into the conveyor system. A vented manifold with filter and fan is located under the bin discharger to help funnel the material into the conveying system airlock and to vent the blow by air from the conveyor airlock. 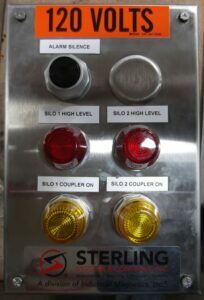 System A includes one (1) Dual Sugar Silo Fill Control Panel which includes a NEMA4X stainless steel enclosure, high level indicator lights and alarm beacon/horn (not shown in picture here). System B: was designed to use a pressure blower to transfer the sugar from the silo rotary valve (airlock) to any one of five use-bins/hoppers located over the kettles. A fifth hopper includes a discharge rotary airlock valve and gravity diverter valve to discharge into either one of two vessels. A hopper loading valve diverts and fills each hopper. Once the hopper is full the valve will divert and begin to fill the next hopper calling for product. Each hopper has a high and low level sensor/indicator and rotary valve on the discharge in order to meter the sugar into the kettle below the hopper. All sugar is returned to the outdoor, floor mounted filter receiver. A rotary valve meters the purged sugar back into the transfer system for delivery to the hoppers. System B includes one (1) Sugar Conveying System PLC/HMI Control Panel which includes a NEMA4X stainless steel enclosure, Operator Interface Terminal, Allen Bradley PLC with required I/O and wiring terminals. 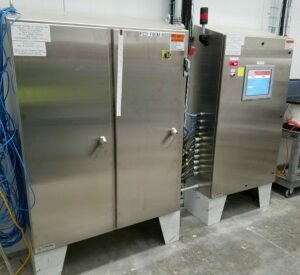 The system also includes one (1) Sugar Conveying System Motor Starter Control Panel consisting of NEMA4X stainless steel enclosure, pull handle power disconnect, 480VAC 3∅ 60Hz 200A main circuit breaker, Control Power Transformer, IEC Stlye and Soft-Starter Allen Bradley Motor Star ters and wiring terminals. System C: was designed to weigh three (3) ingredients into kettles sitting on floor scales. Water and sugar is added to the kettles, followed by granulated sugar. 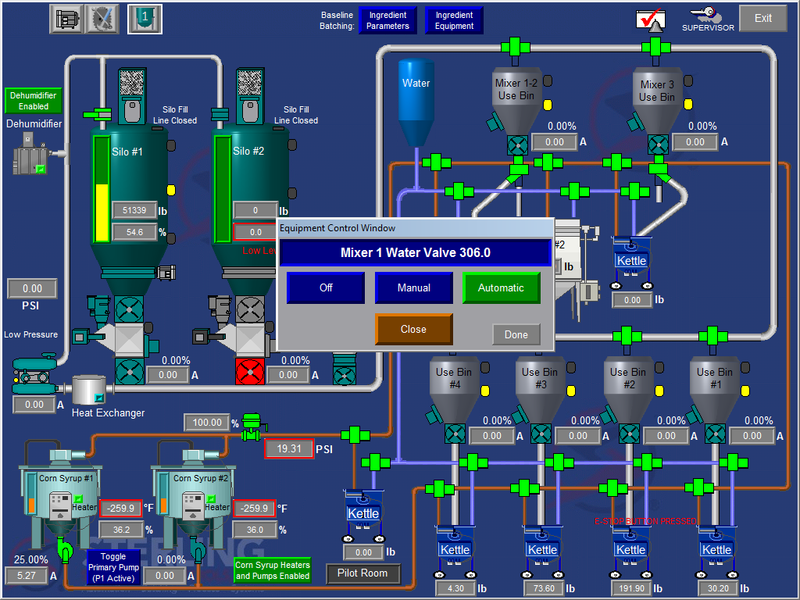 The control system controls the required liquid valves and the surge hopper rotary valve to discharge the water and sugar to the kettles. The system displays to the operator the number of batches of sugar in the sugar hopper, based on reaching the high level and then weighing out of the surge hopper. The system monitors production and the scheduled batches to be produced. 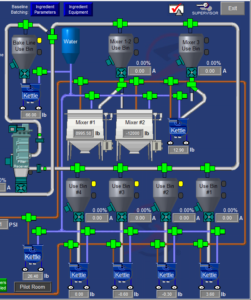 When approaching the end of the day run the system will automatically disable the sugar hopper refill to allow the sugar surge hopper to run close to empty. Batch weights of all three (3) ingredients are saved to the database for audit/historical recall of target/actual batch summaries. System C includes five (5) Kettle PLC/HMI Set-Point Batching Control Panels, each including a NEMA4X stainless steel enclosure, Allen Bradley PanelView with touchscreen Operator Interface Terminal, Allen Bradley PLC with required I/O, one floorscale PLC weight module, Batching Software and terminal connections. 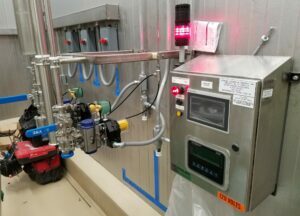 If you would like more information about this application or about our Process Controls and Automation capability and how we can help control and automate your existing or new process, please give us a call at 815-625-0852 or send us an email at sci@sterlingcontrols.com.